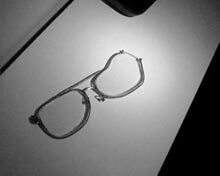 If you listen closely, a pair of broken and mended glasses will tell you a fable about seeing in the twenty-first century. Everything we see, we see twice. To double, to split, to mirror, to multiply—these are tricks performed in secret at the most basic levels of biological existence, as well as in the most complicated machinations of a conscious mind. What precipitates a genetic mutation or a copycat crime? Perhaps no two twos are alike. Becoming and being two is to actively sit in a space of non-prescription. Always on the verge of disappearance, our mental and physical landscapes mirror each other in their porous boundaries, their mutability, and ultimately, their fragility in being subject to forces greater than themselves.iii It is the nature of states (again psychic, corporeal, geographic and political) to elide and deliquesce. The haunting is in the overlap, the trace, the bitter effluvia left after the slow crash of all these things: people and memories and mountains and governments, maps and lovers and chemical spills. Why should these things haunt us? Why shouldn’t they? CarianaCarianne is a multidisciplinary artist team comprised of two individuals sharing the same body. Neither twins nor halves of a split personality, CarianaCarianne equally participate in the conception and realization of their projects, which include durational performances, large-scale installations, and split-screen videos such as Bequeaths and Oath of Signature. Bequeaths documents Cariana and Carianne’s doubled last will and testament, which addresses each artist’s wishes upon death, along with the possibility that one may die without the other. Bequeaths is one in a series of projects that the artists have undertaken with guidance from an attorney to address the rights of a collaborative body. Oath of Signature and its companion piece, On the Lawn of the Whitehouse, both consider the terms of negotiation between separate entities who must coexist alongside one another. 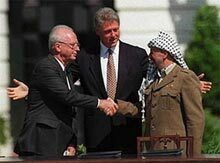 In the latter video, former Israeli Prime Minister Yitzhak Rabbin and former Chairman of the Palestinian Liberation Organization Yasser Arafat share a handshake on the White House lawn after the momentous signing of a peace agreement between the two leaders’ States in 1993. With this and other works, CarianaCarianne recast flesh and bone as a metaphor for contested geographic and ideological boundaries, thereby activating their own body as a potent site for negotiation and discourse. 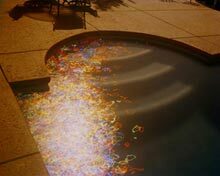 On the morning of September 11th, 2001, Laurel Nakadate climbed to the roof of her apartment building in New York City, set up a tripod and a video camera, and shot several minutes of videotape which would become the work titled stars are blind. 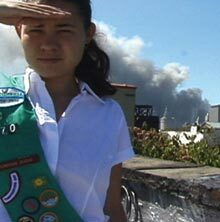 In the foreground, Nakadate dons a green Girl Scout sash and salutes the camera while in the background, billows of grey smoke and ash from the collapsed towers consume the sky. Nakadate’s disquieting presence in front of the camera is a hallmark of her work over the past several years, which has documented the artist’s encounters with strangers met on the street and through personal ads. “I think about the desire to be saved from loneliness,” says Nakadate, “the way one life can change another. I think about the lies we tell and the lies we are told. I am fascinated with the ways lives intersect, and the ways the larger disasters of the world meet the personal, quiet terrors of an isolated life.” Nakadate’s deceptively simple gestures often snare viewers in a voyeuristic double-bind. Here, to meet the artist’s gaze is to mutually acknowledge each other’s distance from the unfolding catastrophe, and to be reminded that willful blindness sometimes comes with an impossible price. Mathilde ter Heijne’s 2000 video titled Mathilde, Mathilde borrows from the texts of three French films made in the nineteen-eighties and nineties, all of which feature ill-fated heroines named Mathilde. Mathilde, Mathilde weaves snippets of dialogue from these films (Francois Truffaut’s La Femme d'à Côté, Jean-Claude Brisseau’s Noce Blanche and Patrice Leconte’s Le Mari de la Coiffeuse to create a fictionalized portrait of the artist and her double, played by a dummy crafted in ter Heijne’s precise image. The body-double is a defining element of ter Heijne’s practice, which centers on themes of female-ness, self-sacrifice, and trauma. Ter Heinje’s multi-faceted videos and sound/sculptural installations emanate emotional force fields designed to collapse upon themselves: in them, the representation of trauma or angst is always interrupted by artifice, so that one’s impulse to empathy runs alongside a constructed parody. With their volatility, works like Mathilde, Mathilde and the double-tongued doppelganger Victory of a False Self probe the outer limits of our psychic terrain, by pressing us to consider what is lost and gained in exchanges of love and violence, passion and hate. Siebren Versteeg’s sculptural objects and computer-driven installations operate as poetic interventions into the flow of information. Employing strategies of tactical media and Situationist-inspired detournement, Versteeg’s practice emphasizes human subjectivity within the vast realm of the technological sublime. “As we leave trails,” writes Versteeg, “we generate a crude consensus, creating the opportunity for others to see the world from a statistical, distanced, and abstracted focal length. From this anthill perspective a potentially troubling situation occurs which makes statistics and averages out of the once intimate and particular whims of communication.” Versteeg’s As the World Turns combines the intimacy of an apparently live web-cam with the absurdity of actual live-feed plot summaries for a popular soap opera. In Neither There Nor There, the artist’s image dissolves as it moves from one flat LCD screen to another, one pixel at a time. Recalling 19th and early 20th century spirit photography, Neither There Nor There presents a portrait of the artist as specter at a time when new technologies are enabling representations of the self to become increasingly dematerialized. i Paul Wadden, The Rhetoric of Self in Robert Bly and Adrienne Rich: Doubling and the Holotropic Urge (New York: Peter Lang Publishing, 2003), 4.
ii While these lines clearly borrow from Roland Barthes’ discussion of photography and death in Camera Lucida (New York, Hill and Wang, 1981), the experience they describe is an intuitive one: familiar, I think, to anyone who has contemplated a photograph of themselves or a loved one. iv Creeley’s original poem titled “Photo” is in The Collected Poems of Robert Creeley (Berkeley and Los Angeles: University of California Press,1982), 553.
v Laurel Nakadate, artist statement, 2006.
vi Mariah Robertson, email to author, October, 2006.
vii Siebren Versteeg, artist statement, 2006.